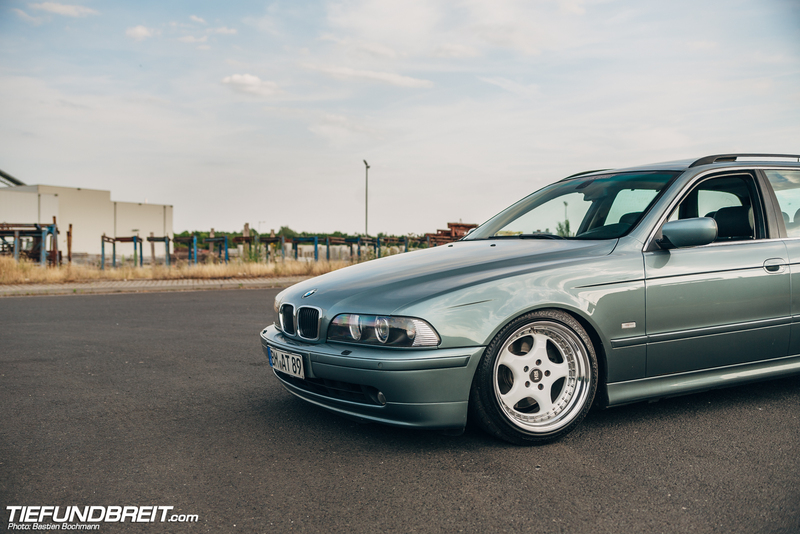 Nowadays, a modified BMW E39 5-series isn’t anything special. Check any BMW message board and you will find literally dozens of them. 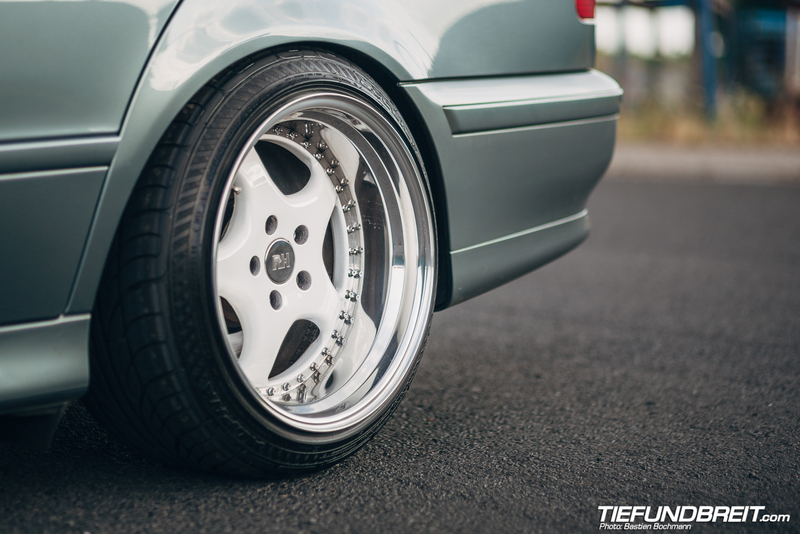 However, most of them adhere to the same style – rather big wheels, usually 18 to 19 inch that sit flush or slightly tucked, M-bumpers all around and usually a rather common color like black or silver. 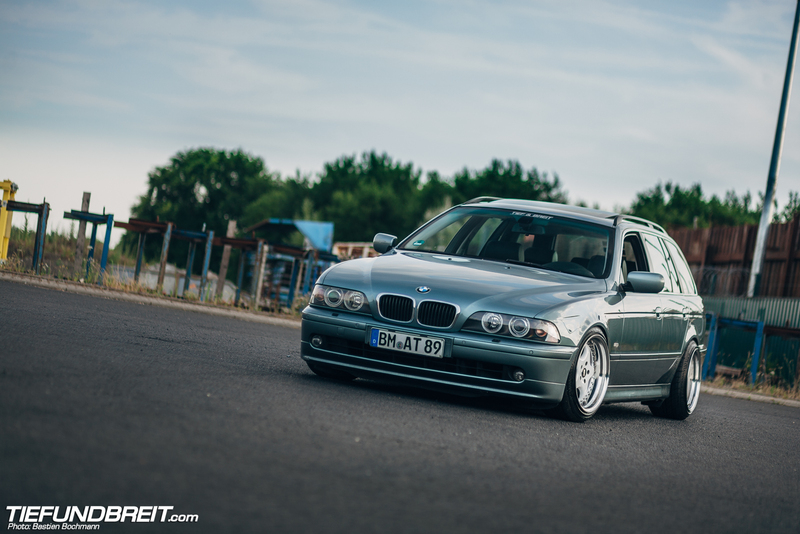 That’s not to say that these E39s don’t look good – but there is a definite pattern. 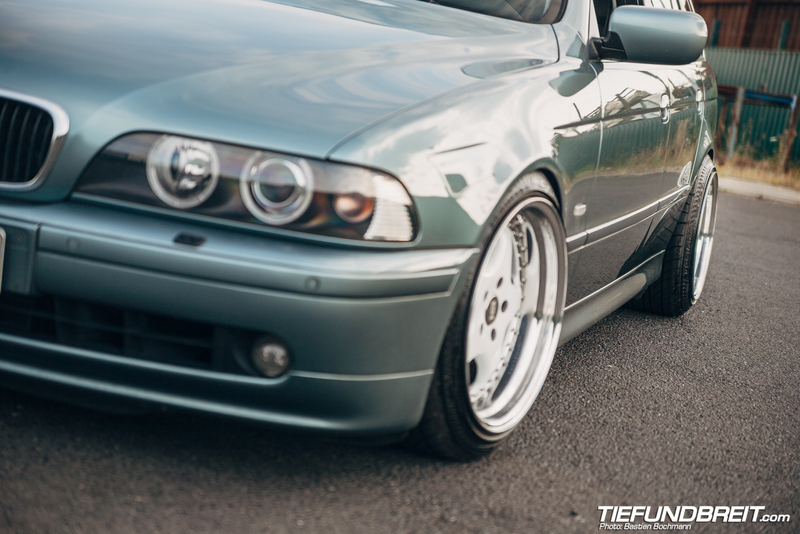 In fact, a while ago I had started my own E39 project – a 523i Touring. Being heavily inspired by japanese kyusha style cars, I had a plan firmly set in my mind. The car was going to be white, low and run on small yet incredibly wide and poking wheels. Fast forward a few months, to when I discovered heavy rust underneath the rear of the car. Enough to make me decide to scrap the project because it would have ended up as a bottomless money pit. That is where Andy enters the picture. I have recently featured his Mercedes 190E just a few weeks back and if you have read the feature you’ll know that Andy is a good friend of mine and in fact rents the garage next to mine. We’re wrenching buddies. 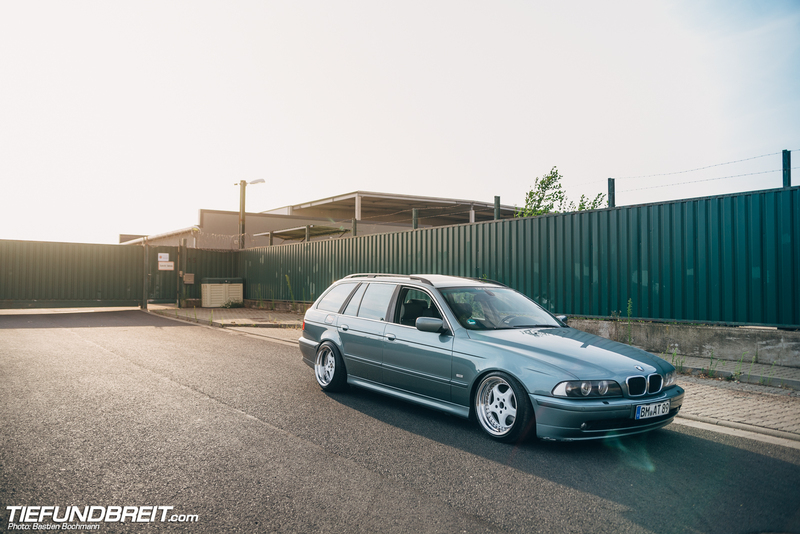 Andy’s daily driver is a E39 530i Touring. 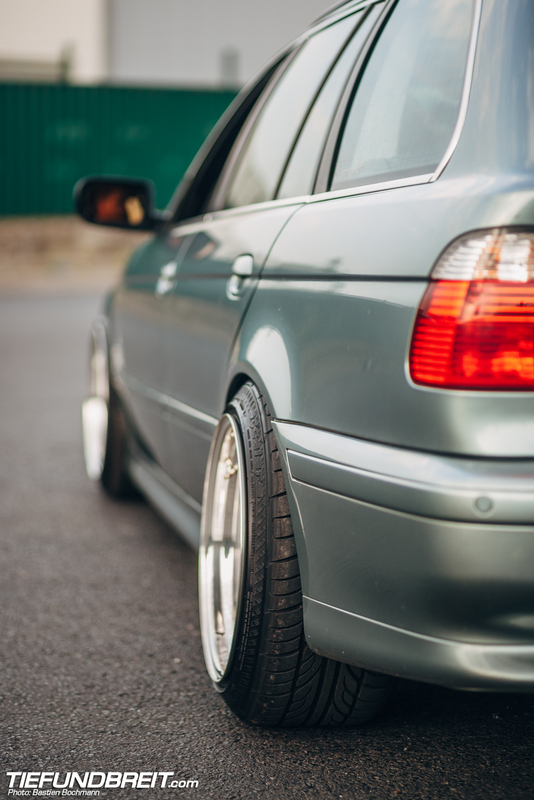 I had previously completed building a set of rather out-there wheels for my own E39 project – but I was looking to part ways with them as my project had to be scrapped. Andy knew what I had in mind when I built the wheels and thus he offered to take them off my hands and complete my vision on his own 5-series. He had already dropped the car on H&R coilovers a while ago, so the lows were already taken care of. The wheels in question are a set of RH ZW1 – a classy 90ies 2-piece wheel that used to be a dime a dozen here in Germany even a decade back. 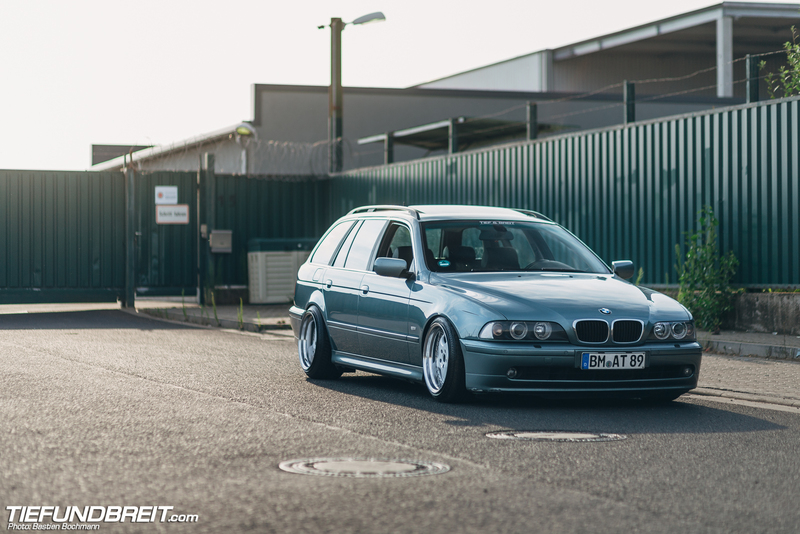 Nowadays the scene has been taken over by Rotiforms and 3SDM wheels and you rarely see such cult classics anymore. The good thing about this is that these wheels usually can be had for quite cheap. The set on this car here started out as 8J x 17 inch. I painted them gloss white and proceeded to widen them to slightly more manly specs. They now measure 10J x 17″ up front with a 3.25 inch lip and 11.25J x 17″ in the rear, packing a whopping 4.5 inches of lip. The final offsets are ET-10 up front and ET-1 in the rear. The result is a old-school poking look, with the thread of the 215/45/17s and 245/40/17s just barely fitting into the wheel arch and the wheel lip poking out heavily. 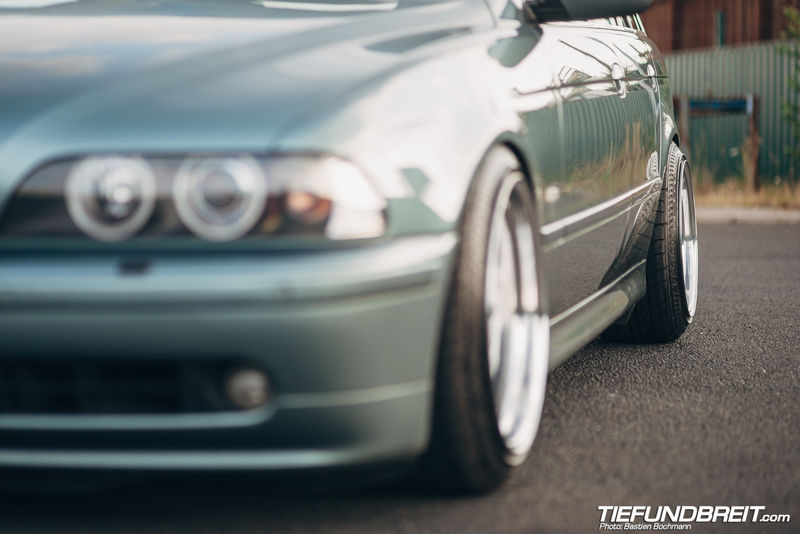 Nowadays, this is not a very common look, but it does definitely bring back memories of the 90ies – although the wheel and tire combos were a bit more sane back then, if I may say so. I guess you could call this a collaborative Tief & Breit team effort. I am happy that Andy completed my vision of a E39 that stands apart from the crowd and Andy is happy that he got a unique set of wheels. 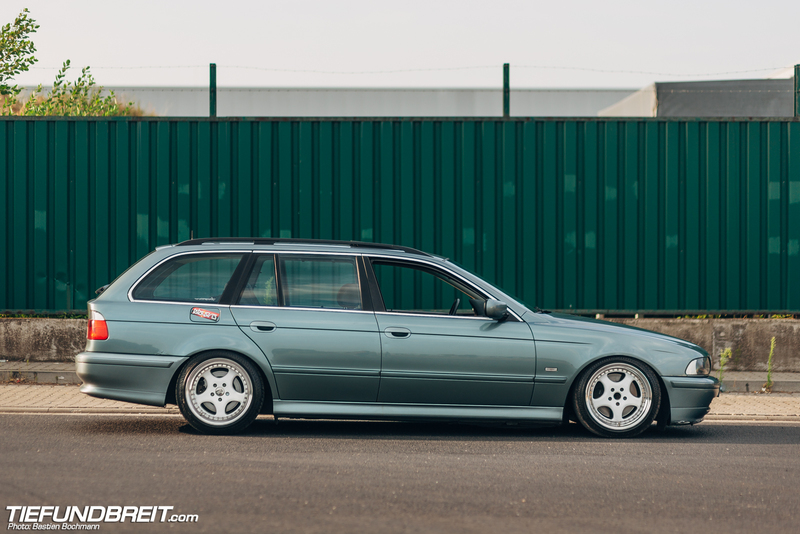 Andy further opted to keep the non-M bumpers, further pushing the car from the E39 norm of 19s and M-bumpers. The car makes for one hell of a unique daily driver – the comfy interior does it’s fair share in this regard also. 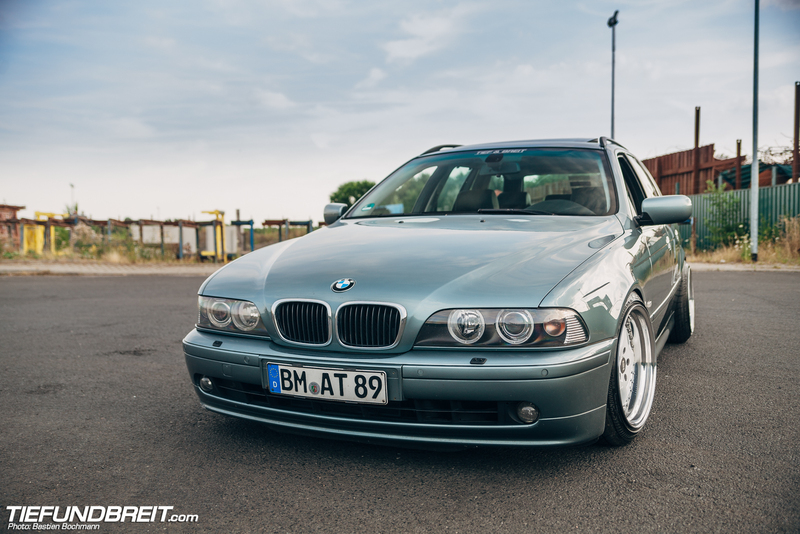 Personally, I think that Andy’s E39 ended up as a incredibly tough looking ride and it’s also a real neckbreaker. People’s reactions are funny to watch wherever he takes the car, simply because the heavy poke is so ridiculous. This car just shows that with a bit of thinking outside the box you can easily create a stunning car that definitely stands out from the crowd. All thanks to a slightly mental set of wheels, this E39 has completely changed it’s visual impact from what it was before. Andy even took the car to Players Classic in the UK a while ago when we went there as a group. Goes to show, that it still retains full useability despite the wide wheels! 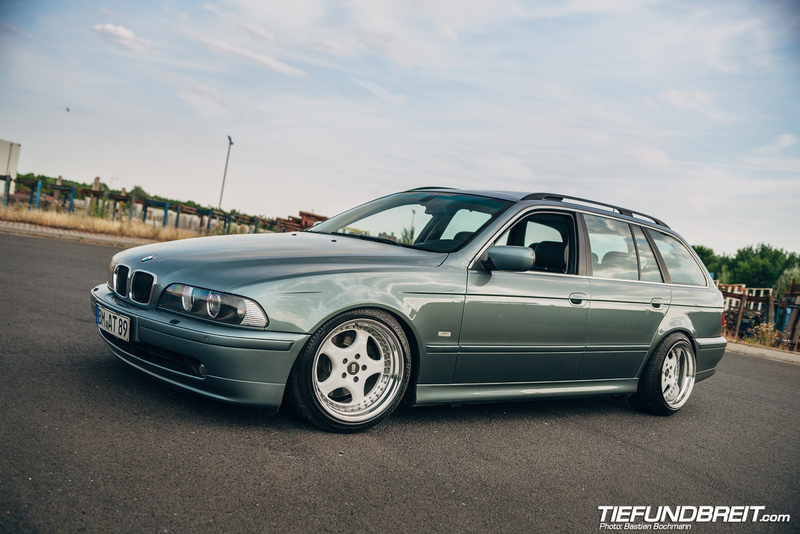 In the end, I guess I just want to say ‘thank you’ to Andy for completing the vision I had of my E39 Touring. This is what friendship is about – having good times together, helping each other out and maybe, just maybe, building the occasional cool car together.